I HAVE TO TRAVEL an hour or so to Cork next week and I'm starting to look at the friendliest options, including electric scooters (145 km range so I have to stop en route for a charge) and a bubblecar (below). Object Chart puts the blue bubble car on top of all other bubble cars. STEAMPUNK, the subgenre of fantasy and speculative fiction epitomised by stories heralding "broadband in Ireland" enjoys a little bounce in Ireland on the run-up to BlogTalk in Cork. According to the experts, "the term denotes works set in an era or world where steam power is still widely used-usually the 19th century, and often set in Victorian era England-but with prominent elements of either science fiction or fantasy, such as fictional technological inventions like those found in the works of H. G. Wells and Jules Verne, or real technological developments like the computer occurring at an earlier date." That just about describes the condition of broadband in Ireland today. I get a home view of steampunk when visiting mom in Pennsylvania. In many ways, mom feels more comfortable around the utilitarian appliances of Amish friends. These long-time friends have throwaway appliances in their kitchens and they use the stoves and the refrigerators as storage locations. Handy and very steampunk in my estimation. It's as though the unplugged appliances sit in their Amish homes in an alternative view of how 20th century modernity ought to embrace technology. And the Amish seamstresses we know have analog cellular telephones as well--they are allowed to use their phones while standing inside a wooden phone box. Using their phones that way keeps their irritating chirpy ringtones inside a box, away from normal conversation that can occur uninterrupted by this handheld conduit to the English world. 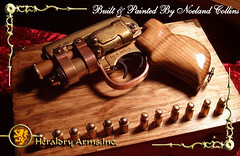 Candy Lavin --"Another cool steampunk design"
Steampunk Magazine is available in PDF download. Also see The Industrious Clock. I TOLD LOUDER VOICE "Newer carriages mean higher comfort levels" when traveling with Irish Rail today. 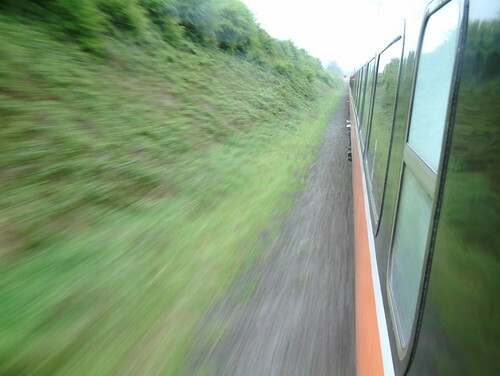 New Irish Rail trains enhance the Cork-Dublin run, a service that might exceed 100 mph on many segments once the rail bed is strengthened. You wouldn't want windows opening at those speeds (like the open window that gave me the shot above) so for both safety and noise abatement, the carriages offer a sense of comfort normally associated with some intercity rail routes in Germany. Photos shot by Bernie Goldbach aboard Irish Rail. WE HAVE FRIENDS who will travel to Ireland for St Patrick's Day to visit our home in Cashel and enjoy the fireworks there during the Skyfest. When they asked us for travel tips, we told them to bring an unlocked mobile phone with them and we would let them use our MAXroam SIM. They didn't know what we were talking about so we explained that the SIM would let them keep a US phone number on their phone along with an Irish phone number too. That still didn't make sense to them until we told them that they could divert all their calls from home to the US number on the mobile phone and then answer the phone if they wanted when it forwarded their home numbers. Since they have a competitively priced call forwarding service already, it costs nothing additional to divert their calls to the MAXroam number and onto their mobile phone in Ireland. Then I told them that since the MAXroam SIM made the mobile phone think it was an Irish land line, all calls made from it to restaurants, airlines, or taxis would be much less expensive than dialing from a pub or a hotel. Assuming their phone usage will be the same this year as it was in March 2005 when they visited, the little MAXroam SIM will save them the costs of a restaurant meal when visiting for St Patrick's Day in Ireland. 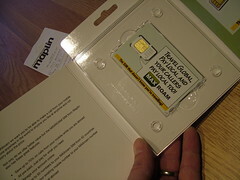 Details and photos about the MAXroam SIM that we bought in Maplins of Limerick. UK Travel Guide reference to Cashel, County Tipperary, Ireland. LIKE THOUSANDS OF OTHERS listening to national radio in Ireland last week, I was amazed by the ideas of Jimmy Mulroy, the Fianna Fail chairman of Louth county council (at left). Mulroy had a plan to tackle the abuse of unskilled migrant workers who were being screwed by unscrupulous employment agencies. Liam Fay picks up the story in The Sunday Times. "Rather than tolerating a situation in which some immigrants are underpaid, Mulroy argued, we should level the playing pitch by reducing the wages of all immigrants. The councillor had clearly given his proposal considerable thought, drawing upon his unrivalled understanding of the immigrant mind. Unskilled migrants shouldn't be paid the same wage as their Irish counterparts, he contended, because most foreign workers come from poor countries with much lower costs of living than ours." THERE ARE MANY REASONS why I try not to carry a laptop when flying out of the country. I have seen border police power up laptops and scan their contents. Although I have not seen anyone actually cable out the contents, I once traveled into a southwest Asian country where my laptop was impounded overnight. I have no idea if it was powered up for data transfer. I don't think they read my copyright warning. I know the ever-vigilant TSA guardians can ask to see anything electronic that you're carrying. They owe no one the duty of confidentiality. I don't want them flicking through the contents of my hard drive. SUNDAY PAPERS GET a whiparound treatment on Irish talk shows but because the topics discussed often exceed the professional experience of the hosts and the panels, all listeners get is rewarmed speculation. Facebook and revenue inspectors got mentioned this week on national radio so that means no one should expect that panel members have ever used Facebook, LinkedIn or any other online social network. That doesn't mean that the panel won't have an opinion about the topics--opinions come fast and furious. During the Sunday Business Show on TodayFM with Ted Harding, a few minutes of discussion revolved around a front page article concerning Evert Bopp's experience while being audited two weeks ago. He "was shocked when a tax inspector produced print-outs of his activities on Facebook Xing and LinkedIn." IRELAND SHARES A common travel area arrangement with the United Kingdom and under plans well-advanced between the two countries, "passengers travelling between EU countries or taking domestic flights would have to hand over a mass of personal information, including their mobile phone numbers and credit card details, as part of a new package of security measures," according to Ian Traynor in Brussels. "The data would be stored for 13 years and used to 'profile' suspects." The Liberal Democrat MEP Sarah Luddford wonders, "Where is it going to stop? If you ask the UK government how many terrorists have been picked up (with data profiling schemes such as this one), you don't get a very straight answer." That's because the profiling scheme is based on a pattern of behaviour that any well-intentioned terrorist can circumvent. Data gathering escapades such as the current UK pilot programme help catch fugitives from justice, drug traffickers, and those whose names are similar to who are suspects in cases too weak to warrant arrest. THE UK WILL BECOME the "world's creative hub" if proclamations from the British culture secretary hold sway. A strategy document calls for innovative schooling, thousands of apprenticeships and a Davos-style summit announced alongside a host of proposals to stimulate the United Kingdom's £60bn creative sector.